Wales sometimes seems to be a forgotten part of the UK. At least in my experience. I hear of people visiting or wanting to visit England and Scotland, and Northern Ireland as well as the Republic of Ireland. But I rarely hear much of Wales. As such, I didn't really know what there was to do/see there or even know what to expect. 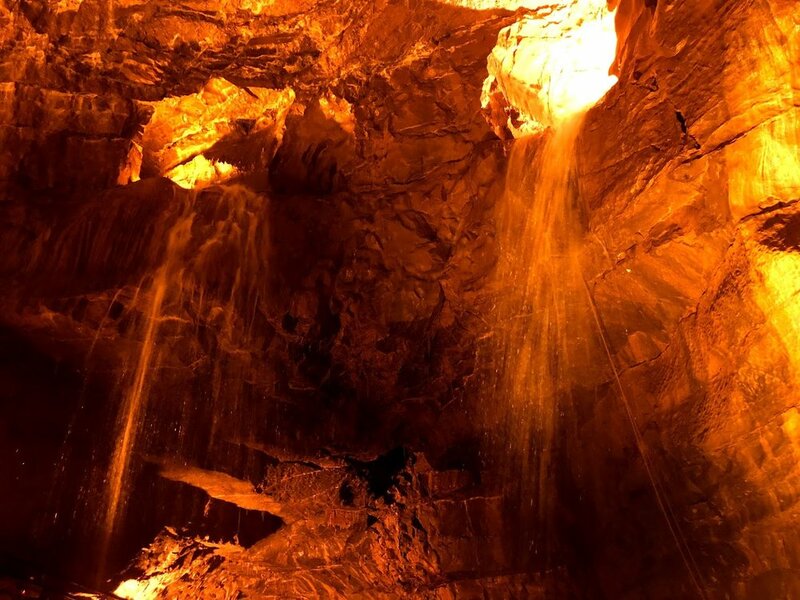 After doing a search for things to do in Wales, I saw some photos of the Dan-yr-ogof caves. During the past few months of travel I've discovered that I'm really fascinated by caves after visiting Rio Secreto in Playa del Carmen-Mexico, Cueva de los Verdes in Lanzarote-Canary Islands, and Poole's Cavern in the Peak District-England. So of course I had to go see the caves in Wales! When you get to the site, parking is free. There's a small field next to the parking lot with sheep, but that's a different attraction. 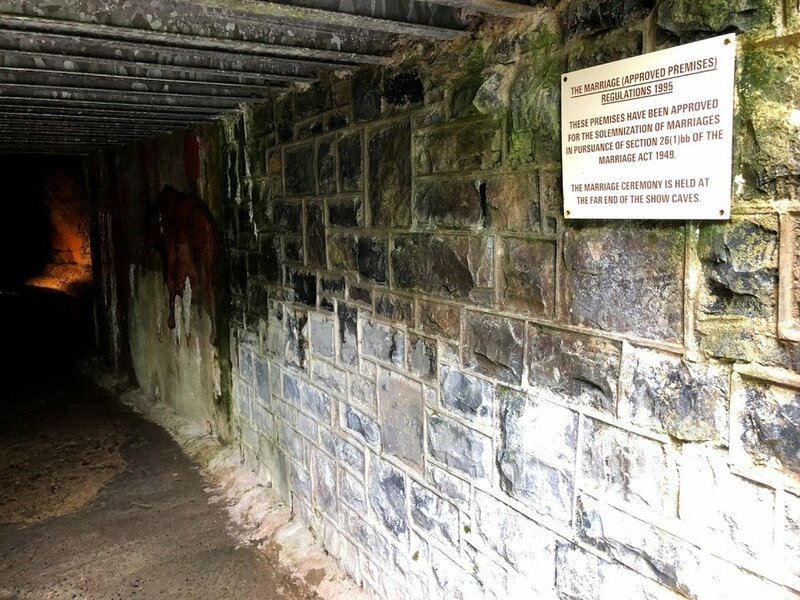 You can walk up the hill to the entrance for the Dan-yr-ogof Caves Park, or there is a complimentary tram that will take you up to the top. A very large dinosaur will greet you, and you get to walk under him to get to the ticket booth. Ticket prices as of Aug 2018 - Adults £15.00, Children ages 3 - 16 £12.00, Children aged 2 and under are welcome at no charge. Honestly, I hadn't done any research about the caves before visiting besides seeing a couple of cool photos and deciding to go there. 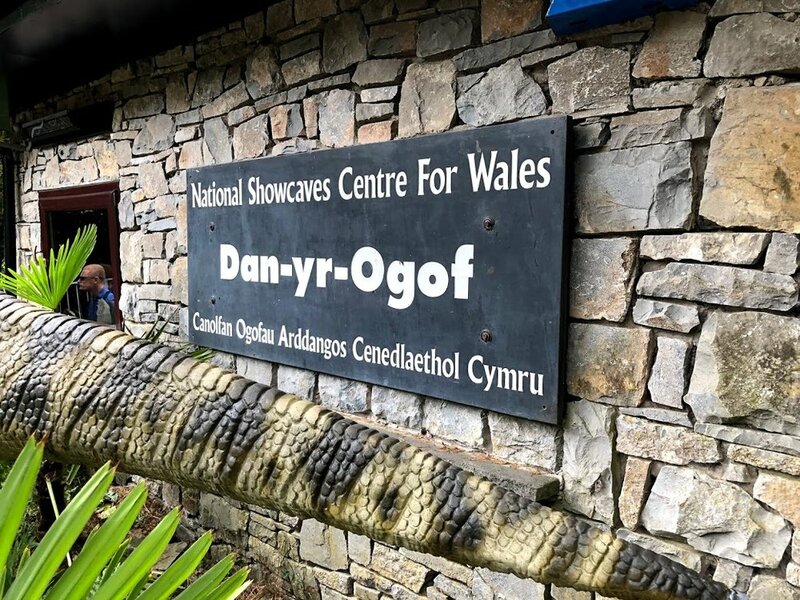 So it was a pleasant surprise to discover how large the main Dan-yr-ogof caves were and that there were also other caves included in the entry to explore like the Cathedral Cave–where you can get married, and the Bone Cave. 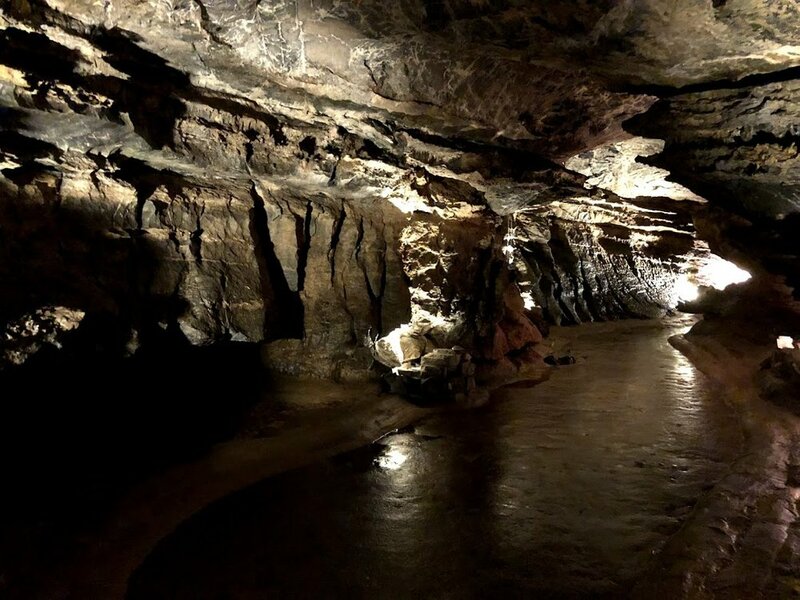 Other caves I've visited elsewhere have required you to be part of a tour group led by a guide, but at Dan-yr-ogof there is an audio guide piped through a sound system within the caves so you can go at your own pace. The audio includes sound bites of people acting out what the brothers who first discovered the caves probably talked about during their expedition. The Cathedral Cave has a gorgeous waterfall and you can view the setup they have for weddings. The Bone Cave has a long, slightly steep walkway to the entrance. The walkway has a low covering over the top so there are helmets provided at the start. If you're over 4 ft tall, you'll have to crouch/bend all the way up to the cave, and the helmets are a must! There is also a dinosaur park, and dinosaurs are scattered alongside the walkways between the caves too. Informative signs are placed throughout the park and there were many excited children pointing out the different names and types of dinosaurs to their parents. At first I thought £15.00 was a bit pricey since the other caves we visited were about half the price, but the Dan-yr-ogof caves were much more extensive and included other activities. It is definitely a family-friendly area, but great for singles or couples as well. Check out some of our other articles by clicking on the images on the side of the page.